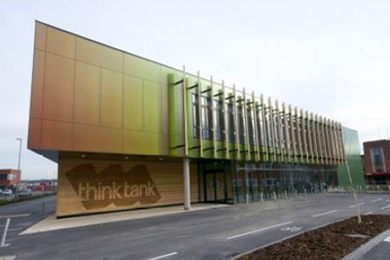 The Think Tank building is based within the Campus of Lincoln University and provides office and meeting room space for various departments of the University and acts as an incubator for start-up businesses alike. The original BMS (Building Management System) although originating from 2008 was poorly installed and configured, resulting in numerous operational issues with plant and ultimately high energy usage. This led the University to approach SGCI to come up with a cost viable solution to replace the entire system, with the caveat to drastically improve user comfort within the building and occupied spaces as well as reducing energy consumption. The building was already installed with 1 Gas fired boiler with 1x VT circuit plus associated pump sets, 2 no. GSHP with associated pump sets, underfloor heating systems (UFH) and a Monodraught natural vent system (NVS). The SGCI solution was to utilise the extensive range of products from Loytec and it was also decided to re-wire the entire BMS infrastructure as the original installation/ cabling was found to be unsuitable in the main and also ridden with faults. A new Control Panel was to be designed and installed within the boiler plant room with spare capacity for future expansion of plant & equipment. All local room/ zones controllers were to be replaced with Loytec LIOB I/O controllers along with all sensors (Temp & CO2), UFH manifold valve actuators as well as Belimo actuators for the Monodraught units c/w end switch interfaces to improve BMS control of the NVS. A new weather station was to be installed to provide wind speed/ direction, rain level and Outside Air Temp measurements. Programs defined within the new BMS are; Boiler plant optimisation, demand led CT & VT circuits, Boiler/ GSHP sequencing, night purge of NVS, improved control and interface of both NVS and UFH for each room/space, improved NVS control byway of utilising CO2 levels, provision of user adjustments to their own room/ space byway of set point adjuster and NVS override switch, time clock occupancy control of landlord and tenant areas, security lock down of ground floor window vent system, alarming of critical plant incl. email notification to Estates Dept. & Facilities maint. Teams. Trend logging both current (24hr) and archived (72 hr+) for each sensor connected. User Interface via LWEB-803 visualisation software loaded onto multiple University PC’s for access to the system incl. PIN-Level protection of adjustable parameters. VPN remote access for SGCI bureau monitoring and support.